2016 has started on a bad note for a$$kali cop, Linda Okello. It’s alleged that Okello was sacked on Saturday after she was found in possession of Ksh. 1,000 during a crack down on police officers collecting bribes from motorists at Kirigiti area in Kiambu. Two of her colleagues narrowly escaped. Unlucky Linda Okello was relieved from her duties after traffic commandant Jacinta Muthoni, ordered disciplinary action to be taken against her. An officer who jumped to her defence said that it was not fair to sack Linda Okello without evidence implicating her of corruption. 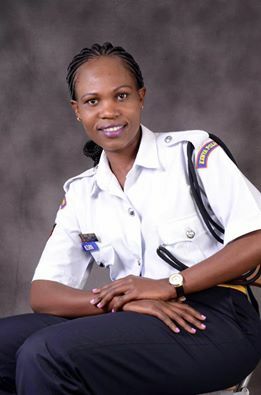 The b()()tylicious cop first shot into the limelight when photos of her in a tight skirt went viral online. This prompted her to become a subject of discussion online. kwani its a crime to be with money.What if the ksh.1000 was her own money to spend after work? something is not adding up here.